Offering CEU classes for Florida Licensed Community Association Managers. INTRODUCING CAROUSEL DEVELOPMENT & RESTORATION, INC.
Joseph Carosella and Michael Bianchini are the owners of Carousel Development & Restoration, Inc. (Carousel) which has had its family owned headquarters in Delray Beach, Florida, since 1979. Carousel has a history dating back three generations. Currently Carousel is qualified by two Licensed General Contractors (Michael Bianchini and Mariann Gerwig), which offers additional protection to our Clients. Carousel was originally Carousel Development, Inc. and developed numerous multi-family communities, apartment complexes, commercial buildings (including firehouses and medical buildings) and government developments. As well as the three hundred thousand square foot (9 Buildings) industrial park they call home. The owners of Carousel always try to stay in touch with Florida’s building needs. In the late 1980’s they saw a need in the area of structural concrete restoration. At that time there were not many (if any contractors) in South Florida that focused on those type of repairs. After completing a few concrete restoration projects of high rise condominiums, the decision was made to amend the corporate name to Carousel Development & Restoration, Inc. Since that time Carousel has successfully completed a substantial number of condominiums, government, industrial and institutional restoration projects. Through our commitment to our Clients, our product knowledge, and personnel training, Carousel has proudly become well respected in our field and South Florida’s largest locally owned Structural Restoration Contractor. It is critical that employers correctly determine whether individuals providing services are employees or independent contractors. Independent contractors are workers who have contractual agreements to complete jobs and who have complete control over their job performance. This article considers some of the advantages to using independent contractors, outlines ways to distinguish between employees and independent contractors, and reviews legal issues that may be of concern to employers with independent contractors. Before getting into a discussion of independent contractors, it is important to note that both the federal government and state governments have been cracking down on employers who wrongly classify employees as independent contractors. The misclassification of employees as independent contractors presents a serious problem for affected employees, employers, and to the entire economy. Misclassified employees are often denied access to critical benefits and protections — such as family and medical leave, overtime, minimum wage, and unemployment insurance — to which they are entitled. Employee misclassification also generates substantial losses to the Treasury and the Social Security and Medicare funds, as well as to state unemployment insurance and workers’ compensation funds. The Department of Labor’s Misclassification Initiative is designed to prevent, detect, and remedy employee misclassification. As a result of the initiative, a worker who is classified as an independent contractor does not have to bring a claim against his or her employer alleging misclassification.Instead, the Department of Labor, Internal Revenue Service (IRS), and/or state agency may initiate a directed investigation which is essentially an unfettered investigation into an employer’s classification of its workers and, potentially, all of the employer’s payroll practices. Many states have entered into Memorandums of Understanding (MOU) with the Department of Labor and the IRS. These memorandums enable the Department of Labor and IRS to share information and coordinate enforcement with the participating states. Avoid paying FICA and FUTA taxes, contributions to employee pension plans, payments of premiums for employee health-insurance programs, and workers’ compensation insurance costs. Obtain qualified and experienced personnel with specialized skills without the cost of training, developing, and maintaining those specialized skills among their own employees. Reduce human resource, payroll, and bookkeeping expenses associated with employees.l Reduce the overall number of employees in the workforce, which could eliminate an employer’s need to comply with certain statutes that apply to employers with more employees. Courts and agencies have increasingly declared independent contractors to be employees because of federal income tax, state unemployment taxes, and workers’ compensation laws, thus exposing employers to unexpected liabilities and penalties. The proper determination and classification of independent contractor status is critical because many employment statutes and regulations apply only to actual employees and not independent contractors. Federal and state income tax. State and federal discrimination statutes. The federal Family and Medical Leave Act (FMLA). Workers’ compensation laws and various protective statutes may also apply solely to employees and not independent contractors. Workers injured on the job may challenge their status as independent contractors to receive workers’ compensation benefits. The first step in determining whether an individual is an employee or an independent contractor under state workers’ compensation law is to properly classify the individual’s occupation, including the criteria for that occupation. In some states, statutory employee provisions cover workers who are classified as non employees. Likewise, employee protection statutes, such as the FLSA, Title VII of the Civil Rights Act of 1964, the Americans with Disabilities Act (ADA), and the Age Discrimination in Employment Act (ADEA) may review the validity of the independent contractor relationship when an issue of enforcement arises. The courts and administrative agencies charged with administering and enforcing these employment statutes use a variety of tests to determine whether an individual is an employee or an independent contractor. Employers should not reach their own conclusions about whether an individual is an employee or an independent contractor without first reviewing applicable statutes, accompanying regulations, and any interpretative case law. State law may consider several factors in deciding whether an individual is working as an employee or an independent contractor. A significant consideration is whether either the employer or the individual has the right to control the means and manner of performance. The National Labor Relations Act (NLRA) excludes independent contractors from its employee definition. However, labeling a worker an independent contractor does not necessarily mean that the worker is an independent contractor. The National Labor Relations Board (NLRB) uses common law agency principles to decide whether a worker is an employee or an independent contractor within the meaning of the NLRA. Under the common law agency test, several factors determine whether an employee or independent contractor relationship exists. An employer controls the details of work performance. An employer provides work supplies and a place to work. A permanent working arrangement exists with the employer that will ordinarily continue as long as performance is satisfactory. The work performed is a part of the employer’s regular business. Workers are engaged in a separate business or occupation, particularly if they are professionals. A specialist does the job without supervision at the workplace. The worker defines the time required for a workday rather than abiding by a typical company workday. The job requires a high level of skill. The employer pays the worker for each, individual job completed. The worker is engaged in a personally owned business. The NLRB warns that these factors do not apply to every situation. The facts of each relationship must be reviewed using the appropriate common law principles. The FLSA and state wage laws may apply only to workers designated as employees and not to independent contractors. Thus, the proper classification of workers is critical to determine the application of these laws. According to the Wage and Hour Division of the U.S. Department of Labor, the employer-employee relationship under the FLSA is tested by economic reality rather than technical concepts. It is not determined by the common law standards relating to master and servant. State courts often use the same test to determine an individual’s employment status under state law, as federal courts have developed to determine whether an individual is an employee or an independent contractor under the FLSA. Under this test, the courts examine factors focusing on the total activity or situation of the relationship. An employee is one who is dependent upon the business to which the individual renders service. The extent to which the services rendered are an integral part of the principal’s business. The amount of the worker’s investment in facilities and equipment. The worker’s opportunities for profit and loss. According to the division, there are certain factors which are immaterial in determining whether there is an employment relationship. Such facts as the place where work is performed, the absence of a formal employment agreement, or whether an alleged independent contractor is licensed by state/local government are not considered to have a bearing on determinations as to whether there is an employment relationship. Additionally, the U.S. Supreme Court has held that the time or mode of pay does not control the determination of employee status. In order to determine whether an employer is required to provide unemployment insurance coverage to an individual, some state unemployment insurance statutes use the ABC Test. Under applicable statute and case law, an employment relationship will exist (unemployment insurance coverage is required) unless and until the employer is able to demonstrate that all three parts of the ABC Test are met. The employer does not and will not control or direct the worker’s performance, under both contract of service and in fact. Work is performed off the premises of the employer or the work is done outside the usual course of the employer’s business. The individual customarily works in an independently established trade, occupation, profession, or business of the same type in which the work is performed. An employer is responsible for injuries caused by employees. However, an employer is typically not responsible for injuries caused by independent contractors. Note: To sue an organization, a third party that is injured by an independent contractor may contest the legal status of the independent contractor. The first step in determining independent contractor status for state or federal income tax purposes is to examine the criteria of the particular individual’s occupation. State tax withholding obligations are usually consistent with the federal tax withholding obligations. The status of an individual as an independent contractor or an employee for purposes of the federal tax laws is determined, with few exceptions, under the common law tests for determining whether an employment relationship exists. The Internal Revenue Code (IRC) provides that individuals who perform work as qualified real estate agents and direct sellers will not be treated as employees for federal employment tax purposes (such as FICA taxes, FUTA taxes, and income tax withholding). The IRC classifies certain employees as statutory employees as an option to the category of independent contractor. This subject is discussed further in the section Taxable Independent Contractors. Full-time traveling or city sales representatives. Note: Federal and state income tax rates are subject to changes annually. Employers should consult with the Internal Revenue Service (IRS) or other applicable legal entity for current rates and scheduled changes. The federal employment tax regulations (such as FICA, FUTA, and income tax withholding) provide that an individual is an employee if, under the usual common-law tests, the relationship between the individual and the person for whom an individual performs services is the legal relationship of employer and employee. Such a relationship generally exists if the person for whom the services are performed has the right to control and direct the services, not only as to the result to be accomplished by the work, but also as to the details and means by which that result is accomplished. That is, an employee is subject to the will and control of the employer as to not only what must be done, but also how it must be done. The regulations state that the determination is to be based upon the particular facts in each case and warn that the designation or description of the relationship by the parties will not be determinative when facts prove otherwise. l Behavioral Control. Evidence in this category includes facts regarding whether the business has the right to direct or control how the worker performs the specific tasks for which the worker is hired. A worker is an employee when the business has the right to direct and control the worker. The business need not actually direct or control the way the work is done — so long as the employer has the right to direct and control the work. Facts that show behavioral control include the type and degree of instructions given to the worker, evaluation systems, and the training the business provides the worker. For instance, if the business provides the worker with training on how to do the job, this indicates that the business wants the job done in a particular way. This is strong evidence that the worker is an employee. 2 Financial Control. Evidence in this category includes facts regarding whether the payer has a right to direct and control the business aspects of the worker’s activities. Facts that show financial control include how the worker is paid, whether expenses are reimbursed, and who provides tools/supplies. 3 Relationship of the Parties. Evidence in this category includes facts that illustrate how the parties perceive their relationship to each other.Relevant facts include those that show the intent of the parties with respect to their relationship and whether the parties were free to terminate their relationship at-will. The permanency of the relationship between the worker and the business is also relevant in assessing the relationship. For instance, if a worker was hired with the expectation that the relationship would continue indefinitely, rather than for a specific project or period, this would demonstrate that the general intent of the parties was to create an employer-employee relationship. Note: In each case, employers must consider all the facts and factors because no single fact will provide an absolute determination as to whether a worker is an independent contractor or an employee. Comments By Mariann Gerwig - As you can see it is not simply a decision of will you make somebody a W2 payroll employee or pay them without deducting taxes and 1099 them at the end of the year. You have a much greater responsibility in properly classifying the person. .
FCAP’s John Wattick with Converged Services Inc., shares why it’s important for board members and managers to monitor trends in technology and why it can even impact a board member’s fiduciary duty if left unchecked. Consumers of all age groups are watching video on many devices and remotely. Recent surveys have shown that over 60% of the viewing audiences have at least 4 devices in their homes and want the ability to remotely enjoy video as well as have access to security systems, lights and other in-home devices. What impact does this shift in viewing habits have on community associations? Access to services and amenities by residents is the reason association board members and management company executives should take notice of trends in technology. The service in this instance is broadband technology. The growing number of Smart TVs, tablets, smart phones and personal computers found in homes across the country is fueling the upward trend in broadband requirements in community associations. 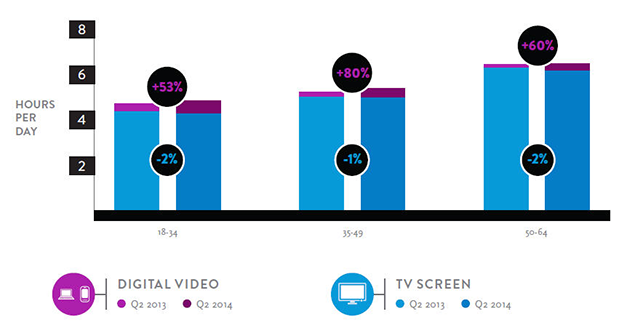 Time spent watching digital video daily among adults 50 – 64 increased 72% in the second quarter of 2014 according to Nielsen’s Cross-Platform Q2 2014 viewing report. More than 70% of U.S. households subscribed to broadband services at the end of last year and more than half of those households surveyed have a TV connected to the internet, according to various research reports. In addition to multiple devices used in homes, viewers are also moving in large numbers to direct streaming which pulls on an already stressed broadband delivery system in some of our existing communities. Welcome to the over-the-top era or OTT as media insiders refer to this period in consumer viewing history named for the proliferation of direct streaming services like Netflix, Hulu, and Amazon Prime. The OTT era is here and it’s not showing signs of slowing in the near future. Researcher Joyce Wang says, “It’s been a busy couple months with numerous significant OTT announcements.” Time Warner execs finally confirmed an OTT version of HBO service to be launched in 2015. CBS is making its OTT service available in its owned-and-operated markets, and last month, Viacom officially announced a deal with Sony to license live and on-demand programming for Sony’s to-be-launched OTT service. Dish is working on its OTT package to be released by the end of the year. The Telcos (telephone companies) are looking to get a slice of the pie too, with both AT&T and Verizon execs signaling their interests in launching similar offerings. A high-rate of subscriptions to OTT services was found among owners of streaming media players—devices like Roku, Amazon Fire and Apple TV, among others—with more than 75% of streaming media player owners subscribing to an OTT service, according to Parks Associates. Online video streaming continues its major transgression into the consumer mainstream, with research firm Frank N. Magid Associates reporting that 83 percent of U.S. TV viewers now stream movies and TV shows, at least occasionally. Another concern association decision makers should keep in mind is that more video content over broadband means the possibility of internet service providers (ISPs) charging for data transport. There is significant scrutiny for the first time into interconnection, analysts say. The risk of OTT depends on whether cable can or can’t price broadband in such a way to offset lost video transport revenue and the most obvious ways to recapture lost “transport revenue” are usage based pricing, surcharges on naked broadband (deeper discounts on bundles) and interconnection pricing. We are seeing this shift reflected in the numbers of broadband internet customers in the major providers’ portfolio vs their traditional video business. Charter has about 4.15 million pay-TV customers and nearly 4.7 million broadband internet customers. Video subscribers for Comcast now total 22.4 million. Comcast now has 21.6 million internet broadband customers. Verizon has a total of 6.5 million Fios internet and 5.5 million Fios video connections. Time warner has 10.8 million TV users and 11.5 million internet broadband customers. As these trends in viewing continue it is imperative that service providers build and upgrade their architecture to handle these demands. 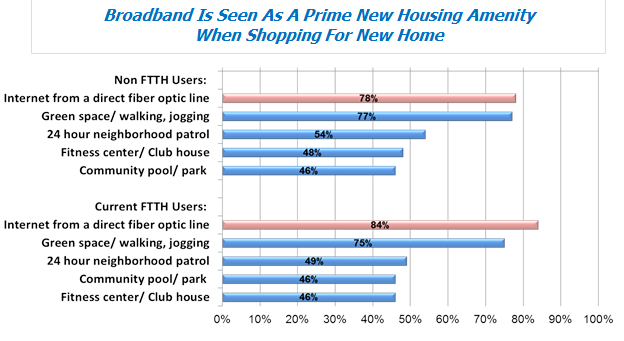 Deeper fiber penetration to the home (FTTH), IP and Cloud technology become essential features homeowners expect in their community. Associations and management companies are beginning to experience selection when an association signs or renews their cable TV, internet and voice agreements, whether they are bulk, ROE (Right-of-Entry) or a combination. The right-of-entry (or ROE) agreement is the legal agreement that allows the service provider to access private property for the purpose of providing broadband services to residents in a multi-dwelling unit such as a high-rise condominium. Under a Bulk ROE agreement, the service provider provides its services to 100% of the residential units at the property, and the HOA pays a monthly bulk fee. Under a standard ROE agreement, the service provider provides its service to any resident who subscribes to that service under a separate individual service agreement between the resident and the provider. The chart below is significant for association board of directors and management companies as many residents are choosing communities that reflect this change in technology and delivery architecture. As a community association board member or management company executive it is imperative to stay abreast of technology and the costs associated with providing or more importantly, not providing access to the latest in broadband services to residents and homeowners. Industry consultants like FCAP’s John Wattick at Converged Services Inc. (CSI) can work with associations to determine if their community’s existing infrastructure is sufficient to meet current and future needs. Visit CSI at www.convergedservicesinc.com for more information on technology and your community. Many people buy homes in developments when they are still under construction. However, there are several things that people do not realize or are not aware of when they do this. The developer creates a mandatory homeowners association (HOA) and is in complete control of the association until a set percentage of the community is complete. Since the developer owns most of the lots while a community is under construction, they usually offer very low association dues as an incentive to purchase. This could change dramatically once the builder leaves and the community has to support itself. Once that percentage is reached, the HOA transfers from the developer to the homeowners. The developer is just like any other owner at this point and must pay dues for the lots he owns. Not many homeowners are aware of or prepared for this transition. Homeowners must create a Transition Committee or an ad hoc board of directors. This committee will make sure that all paperwork, accounting, and closeout issues are addressed before taking over the responsibility of the association from the developer. A General Membership meeting should be held as soon as possible to elect the new board of directors made up of owners. Normally, a developer will call this meeting as the transition time gets closer. However, having a Transition Committee already in the process of being organized will be a great benefit to the association. A management company and legal representation need to be hired for the owner-controlled association. The earlier you can begin to put this team together the better the association will be protected. · Legal representation that is experienced in this type of transition. · Management companies to interview in order to assume the financial responsibilities. · Accounting firm to audit the financial records turned over by the developer. · Financial institutions to transfer the association funds held by the developer. · Insurance broker to obtain quotes on property and general liability coverage as well as Directors and Officers coverage. In addition to these duties, it is recommended that you meet with your local building department, and make sure that the developer has satisfied any requirements the city may have had of them. Do a site survey to make sure that items such as the final coating to roads, which is usually left until all construction is done, cleaning of any sewer lines, cleaning of any man-made ponds or lakes the developer may have created, and landscaping has been completed. Florida currently has a four year statute of limitations period for the filing of any construction defect cases. · All budget, financial, and tax records for every year that the association has existed. · Check to see if the developer has funded any reserve accounts for the association. · All contracts that the developer encumbered the association to. · Current and past owner records, including approvals or denials of improvement requests. · Site plans of the development. Please keep in mind that we have discussed many issues in this article but not all. Many additional issues may be discovered while doing your due diligence. The sooner the association begins to organize and select the professionals they will be working with the better. It is much easier to get the cooperation of the developer when they still have a presence in the community. Mariann Gerwig, GC, HI, CAM, CAM Continued Education Instructor has been the Director of Finance and Operations at Carousel Development & Restoration, Inc. since 1988. For more information, contact her at (561) 272-3700, e-mail mgerwig@cdri.net, or visit www.cdri.net. Mariann has also been the Chief Financial Officer for Aluminum Design Products, Inc. since 2011 you can contact her there at mgerwig@apdinc.biz. Mariann was part of the Ad Hoc committee 2000 and continued on as a director for nine years at her own association.